I am trying to do something every morning, a quick sketch from a photo I took, or something that catches my fancy. It’s not easy and most of the time I am disappointed by what occurs. The reason? It seems that often the only way to save something is to add lines! I wonder if I will ever produce a “real” painting that is more than just sketch . . . Ah, well. The point is to do something as often as possible. 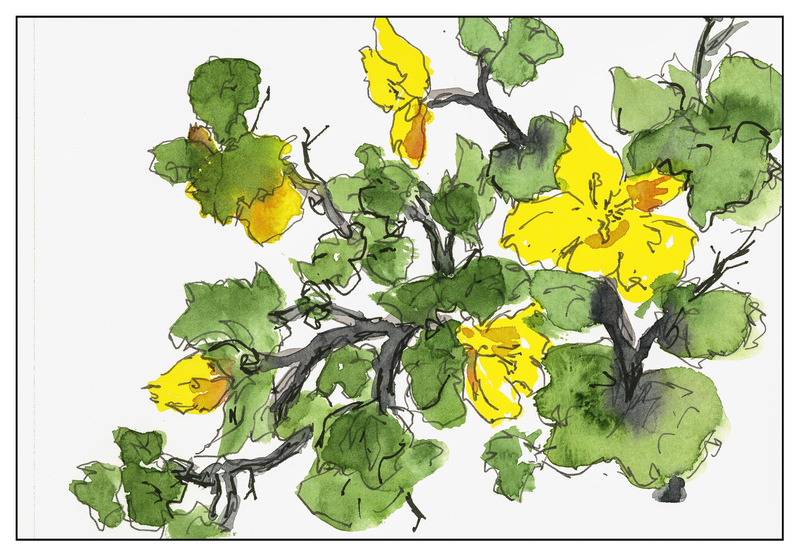 Thus, a sketch of a Fremontia, a yellow-flowered bush found here in California. It’s a woody shrub that splotches bright flowers against dark leaves. I look forward to them every spring.